As planned, I checked out the season premiere of 24 last night. So far, so good. In previous seasons, it sometimes took too much time to get the action going, but this year started out full throttle almost right away. Can someone please explain to me why a trained professional, Michelle, is now dead, and yet the ever-annoying Kim, whose only talent is getting into trouble, still lives and, reprotedly, will make an appearance about halfway through the new "day?" Could it be because Kim's main talent is for getting into trouble? Her character provides grist for "Perils of Pauline"-type situations. 4 of 24 hours gone in two nights. That leaves 20 more hours without sleep, food, or a bathroom break. I think Keifer has been clinically dead and revived more as Jack Bauer than his roles in Flatliners and the Lost Boys combined. Ha - I got cheesed off with 24 after the first series. Just too much Kim,as well as too much violence. And rather too much justification for a "nuke-the-goddam-terrorists" mindset for my liking. I prefer Spooks. These are anti-terrorist government agents who work in an often corrupt and venal environment, yet without compromising their personal principles of justice, human rights and common morality; every week they defeat terrorists and international criminals with the absolute minimum of "wet-work". And anyway, Rupert Penry-Jones is a whole lot hotter than Keifer "chipmunk-cheeks" Sutherland! you know that show is a right-wing 9/11 wallowfest, right? if that show hadn't been on television, we wouldn't be having the stupid "ticking time bomb" argument in regard to torture, because no one would believe those situations actually occur, like they show on the teevee. by watching, you're encouraging the pro-fear morons who make it. Give me a freakin' break here. 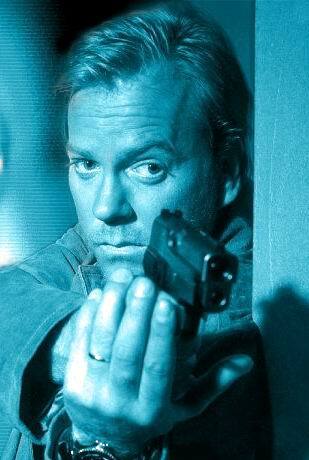 24 started weeks after 9/11, which meant the first season was in production before 9/11. And do you really think that the "ticking timebomb" argument was invented in or even popularized by 24? You watch your TV shows; I'll watch mine.